Have you seen a Swift? The Gift to Nature scheme with the support of the Isle of Wight Biodiversity Action Partnership, is asking you to help our swifts. Since 1994 over half of the entire Swift population in South East England has been lost. This is likely to be the result of complex and interlinking factors both here and in their wintering grounds. We would now like to track down the real hotspots of swift activity, the places where these birds congregate in Island towns and villages; the places where they are most likely to stay and breed. Given this information it will be possible to not only conserve nest sites for the future but also to create complementary new sites through the use of special nest boxes on existing buildings and swift-friendly designs in new buildings and redevelopments. What do Swifts look like? The adult is sooty brown all over with a paler chin, often though it will appear very dark, almost black. The wings are long and scythe-like, swept back and flapped very rapidly but rather stiffly with no obvious ‘elbow’ bend. The tail is short with a narrow fork not so deeply cut as a swallow and often appearing closed up. The voice is a piercing scream, quite unmistakable. 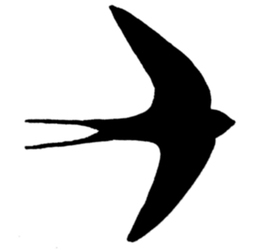 Swifts might be mistaken for swallows and perhaps house martins but their distinctively long-winged appearance (see silhouettes below), all-dark colouring and loud call will help to confirm identification. Makes nests inside eaves and gables. Builds a mud and straw nest inside sheds, car ports and barns. Builds a mud nest under eaves or gables. 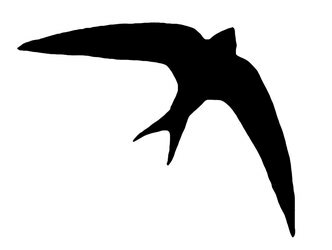 Gift to Nature would especially like to know about schools, churches, libraries, village halls, sports centres and any other public and community buildings which might be home to swifts but any and all breeding sites are important. 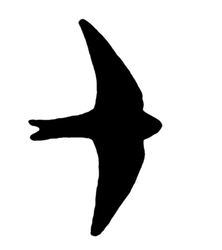 Of course you may have swifts yourself in which case, get in touch or complete our short survey. A swift’s body is on average 17cms long but its wingspan can be up to 48cms. Swifts are amongst the fastest birds in the world. Swifts feed exclusively on flying insects caught up in air-currents. Swifts usually nest within the same area as other swifts. Swifts fly directly into their nests, their feet are just too small for hopping or walking. Swifts fly non-stop outside the breeding season, going perhaps eight or nine months without landing at all. Swifts have taken flight to the extreme; they eat, mate and even sleep on the wing. Quite unable to perch they never touch the ground and will simply cling to walls or slip into roof-spaces where they can easily drop back out again. A young swift may spend its first couple of years continually flying! These amazing birds are long-distance migrants and arrive on the Island from Africa in May (rather later than swallows and martins) and leave us on their return leg in August, but in those few months they make themselves quite unmissable. Their spectacular freewheeling aerial acrobatics and ear-piercing screams are as much a part of an English summer as Wimbledon and weather forecasts. But something is now wrong. Since 1994 over half of the entire Swift population in South East England has been lost. This is likely to be the result of complex and interlinking factors both here and in their wintering grounds but one major problem is undoubtedly the refurbishment, redevelopment and demolition of old buildings. Swifts would once have been cave, cliff and tree-hole dwellers but have become adapted to man-made structures since Roman times; as the easily accessible eaves and lofts of older buildings disappear so do the swifts and if they cannot find places to nest and breed their numbers will surely continue to decline.